The blue pill or the red pill? The blue is a revised diesel heart, while the red breathes through a new petrol one. And all I am offering here is the truth. No, this isn’t Neo who is about to experience the truth about the Matrix. 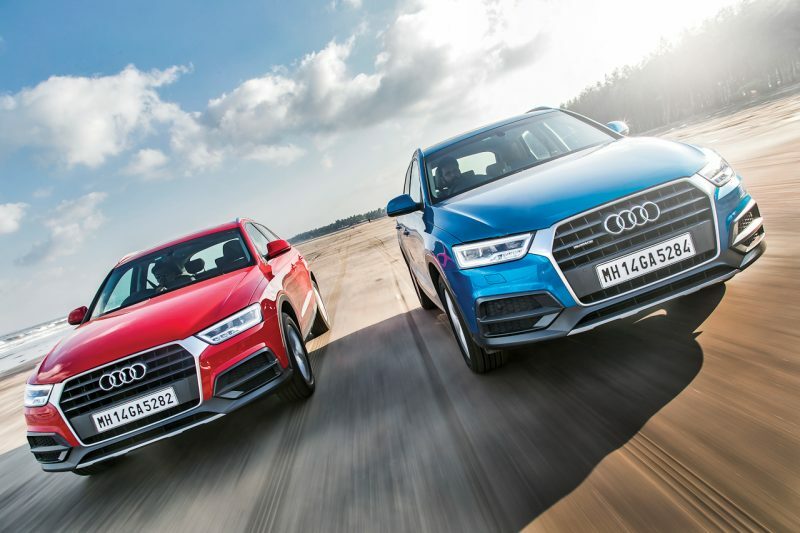 Instead, what I’m referring to here are the 2017 editions of Audi’s entry-level SUV offering, the Q3. 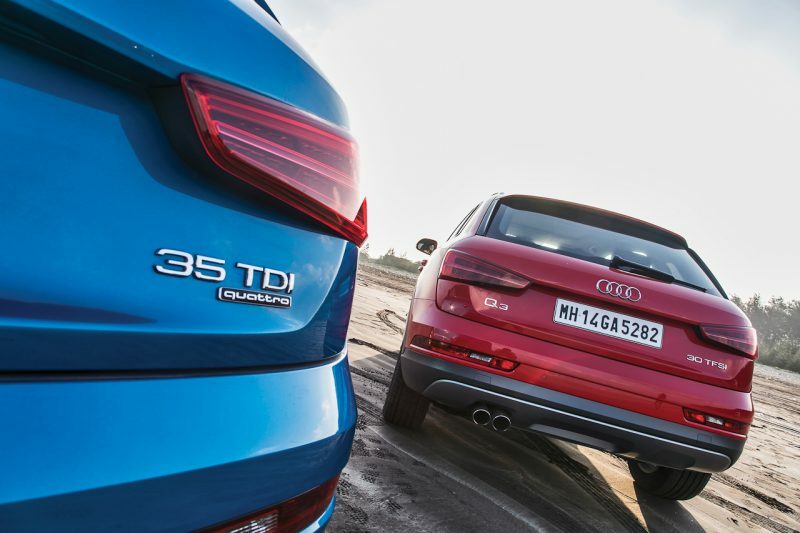 It has been almost five years since the German four-ringed brand introduced the Q3 in India. This small yet handsome urban SUV has managed to strike a chord with buyers of defined and specific taste in the SUV market. 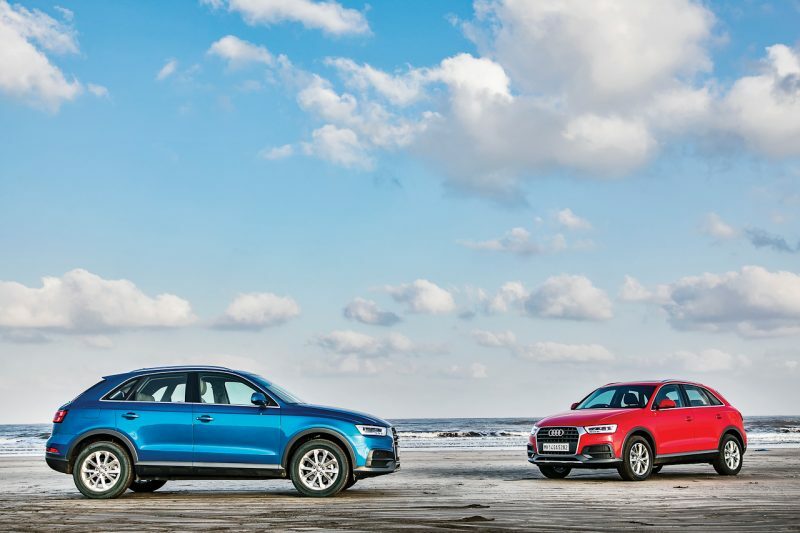 And now, in order to fortify its segment position in the SUV market, Audi has updated its Q3 range to make it an even better package. Speaking of packaging, the 2017 Q3 models have been refined in the form of a mid-life update. At first glance, one would not be able to figure out the transformations, but look harder and you notice the fine alterations that differentiate it from its predecessor. To begin with, Audi has re-sculpted the front bumper which now features larger air dams on either side along with some more plastic cladding. LED headlamps and LED tail-lamps with dynamic indicators are now a part of the standard package across the range. Also, to top it off, 17-inch alloys which were previously available only in the top-spec trim of the Q3 are now standard on all trims. The subtle updates continue to the interior of the urban SUV as well. Sorry, no new dashboard design to be happy about, but there are new additions which make the cabin feel fresh. Sporty aluminium inlays make their way onto the dash for the 35 TDI variant, while the 30 TFSI receives walnut brown colour inserts. The front seats now get electric adjustment which makes it less stressful to share the car with your better half. Only if you wish to, of course. Also, a two-zone climate control system is now standard, but the clicking knob to adjust the same could have been designed better. The overall interior space remains the same with sufficient room for front passengers while comfortably accommodating two adults in the rear seats. Of course, both versions of the Q3 come with a panoramic roof with an electric sunblind that adds to the desirability of this car. The pop-up screen on the centre console now features an updated MMI system with more options, but it can take a bit to get used to. Surprisingly, Audi has skipped on Apple CarPlay and Android Auto which nowadays has become more or less a standard feature in most luxury car brands. The most interesting part of the Q3’s update is what’s on offer under the hood. 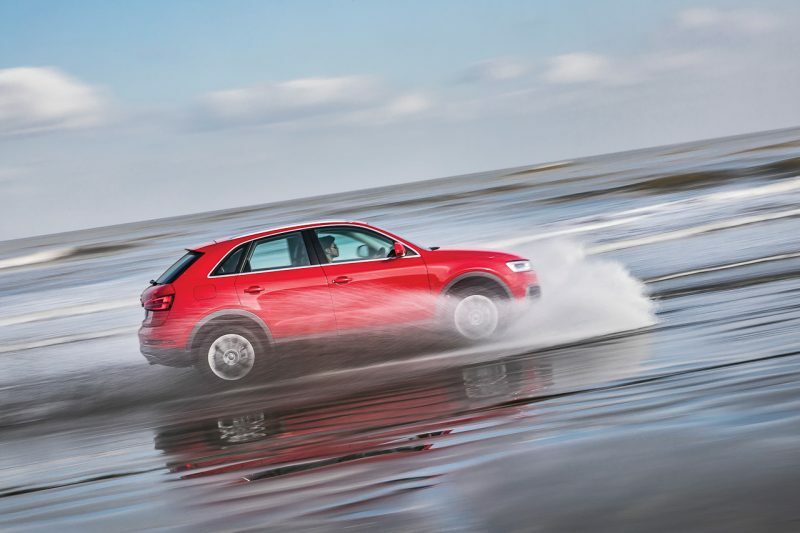 Until now, the Q3 was available only with a diesel motor which left buyers with no option. Now, Audi has introduced a turbocharged 1.4-litre four-pot petrol engine that puts out 148 bhp and 25.49 kgm. The motor is silent and smooth with notable grunt under acceleration. 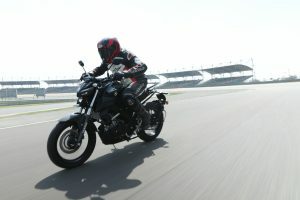 The power figures might not be all that great but this thing is nippy and quick in picking up the pace on the throttle. 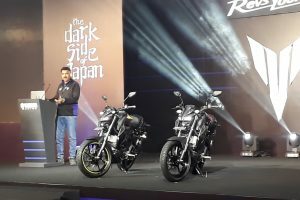 The sweet spot for the engine is in its mid-range which goes all the way up to its redline at 6000 rpm. The 6-speed dual clutch S-Tronic gearbox offers quick and accurate shifts which complete the package. Being a compact urban SUV targeted primarily for city travel, the steering is nimble and light which is good, but enter the triple-digit mark on the speedometer and the lightness can be a bit of an issue as it lacks a firm connect with the wheels. Moving to the 35 TDI quattro, the car features the same 2.0-litre oil burner but gets a slight bump in power. On paper, Audi says the motor now produces 4 per cent more power at 178 bhp, while the torque figure remains untouched at 38.74 kgm. Performance remains engaging as before which coupled with the slick 7-speed S-Tronic quattro transmission is always ready on the call with the next gear at the right rpm and when in the mood for some spirited driving. And the paddle shifters are a great accompaniment for precise gear shifts. The diesel model is heavier than its petrol variant (1565 kg) by 65 kg which, in addition to the AWD system, helps it offer a slightly heavier steering feedback at higher speeds. Both the Q3s come with four drive select options to better suit the driving style of the person behind the wheel. The Comfort mode is ideal for day-to-day driving, while the Dynamic one quickly changes its character for a sportier response in power delivery and handling. The new addition is the Efficiency mode which is better suited for rush-hour traffic. And if you don’t like to fidget with modes, switching to Auto takes care of everything on its own. Apart from what’s under the hood, these two variants of the Q3 are almost identical in terms of dimensions and equipment. The diesel, being heavier than the petrol version, sticks to the road better and adding to its stability is the quattro system. The petrol, on the other hand, is easier to flick and requires a slightly firm hand at the wheel when it comes to chasing triple digits. In the Q3’s case, I really wouldn’t mind gulping down both pills simultaneously. Either of the options makes for a well-rounded package. 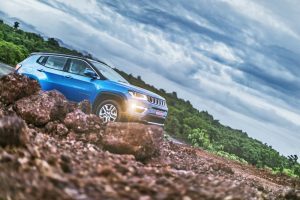 Yes, for the same price, there are other full-fledged SUVs like the Endeavour and the Fortuner which could offer more at a less price, but sometimes it is also the taste that matters the most. The 30 TFSI with its FWD setup is the deal to go ahead with if it’s just the city that you prowl in. But if you are the adventurous type who wants to expand their reign beyond the city limits, the 35 TDI quattro is the SUV for you. 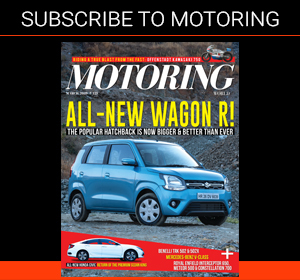 In its segment, given its equipment and variants, the Q3 nicely makes its place between its direct rivals, the Mercedes-Benz GLA and the BMW X1, ticking off most boxes for the luxury compact SUV buyer.